I had a request for how to make my poppy wet felted picture and whilst I don't have photos of how I did that particular one I can give an idea of what to do, with photos from my WI craft group who I taught. 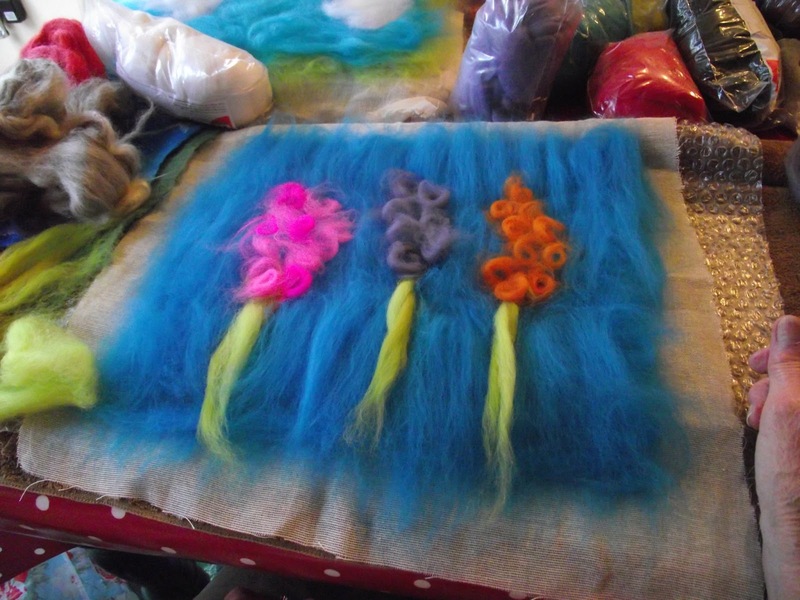 roving in the colours you wish to use. The above is before embellishment. 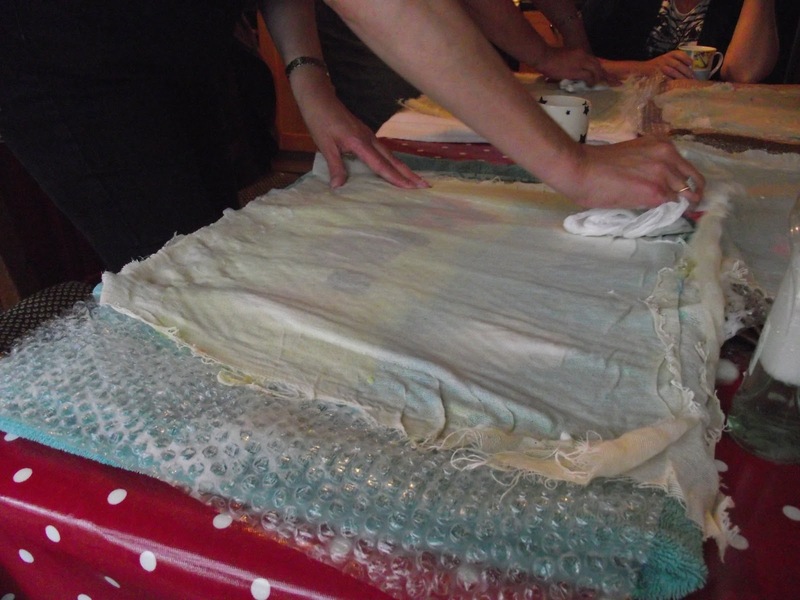 Firstly place the towel on the table and then add the bubble wrap, then a piece of Muslin. Now you need to add your roving . You tear off 3-4 inch strips which you then place a layer of in one direction, then the next layer goes in the oposite direction and then the other again. You need about 3 layers. 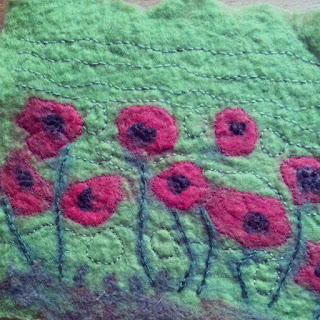 For the poppy picture I did, I used green roving, which I made 3 layers of, then I added clumps of red. which I made into a circle, then added darker green strips for the stalks and a tiny bit of black for the middle of the poppies. The above photo shows the layers with the detail ontop, but this is another design. Then you add another piece of Muslin on top, then using the bottle filled with a small amount of washing up liquid and warm water, wet the whole area, but not too much , just so it is damp. then using the plastic bag scrunched up work the soapy water into the muslin, using circular and back and forth movements.You need to do this for a while, pulling the muslin back every now and again to make sure the roving hasn't stuck to the muslin. Pull it off and turn it over and carry on, repeating this.You can add more warm water as needed. This takes quite a while, but is worth it :0 You will know when it is finished, when you feel the felt between your fingers and it doesn't move apart, but feels like felt! Next pour on cold water and repeat the actions, until it has shrunk and you are happy with it,and it feels solid.When it is ready take the felt out and rinse under cold water, it will shrink even more! but don't worry. 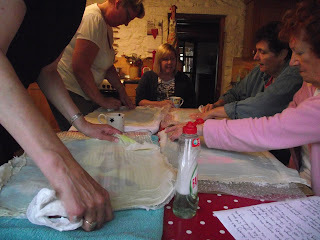 Then when you have rinsed all the soap out squeeze well and leave to dry. When it is dry you can hand embellish with thread and beads!